We bought some chicken Buffalo style sliders the other day so I wanted to make some tasty buns to go with them. The buns needed to be hearty enough to hold the burgers and the fixings as well as soft enough like a hamburger bun needs to be. I adapted a recipe from KAF and made several changes including the flour types and changes and additions in several ingredients. I added some dried onions and some Parmesan powder to give it a little extra flavor and just enough honey to round out the flavor profile. These would have been perfect had I not left them in the oven a few minutes too long since I was working at the same time I was baking these. One of the benefits of working from home but also one of the possible pitfalls. 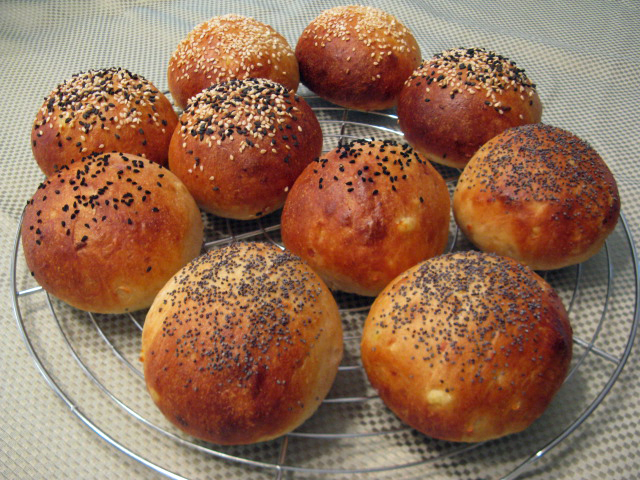 In any case these tasted great and made perfect burger buns and sandwich rolls as well. If you try these you will not be disappointed, of that I can guarantee you. 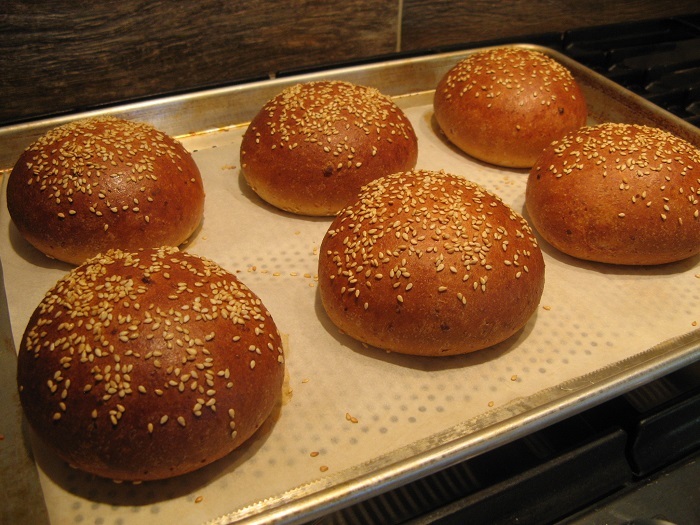 The European style flour I used has a small percentage of white whole wheat flour and malt which along with the Spelt flour and Durum flour really gave these rolls some excellent flavor. Mix flours with yeast to combine. Next add remainder of the ingredients and mix on low for 1 minute and then for 9 minutes at speed number 2 and 1 minute at speed number 3. You want to mix/knead until you develop a nice thin window pane which will ensure that the rolls end up nice and soft. 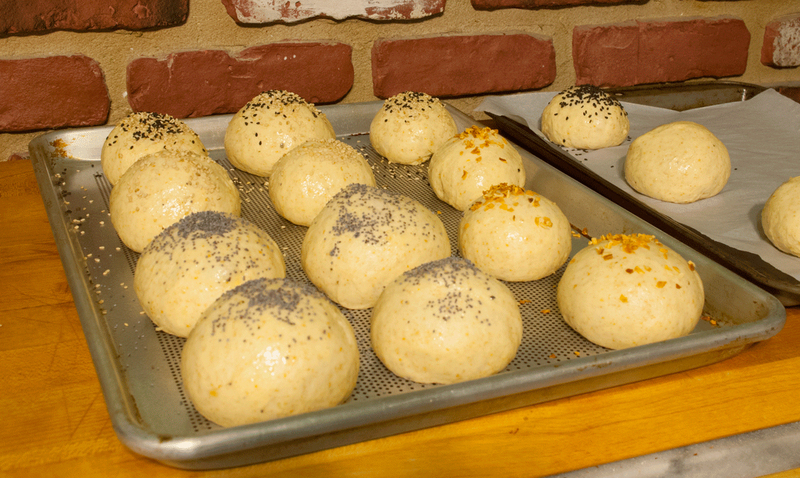 Take the dough out of your mixer and form it into a ball and place in a well oiled bowl or dough rising bucket. Make sure to cover the dough and let it rise at room temperature of if you have a proofer set it to 82 degrees and let it rise until doubled. It took me about 1 hour to double in my proofer. 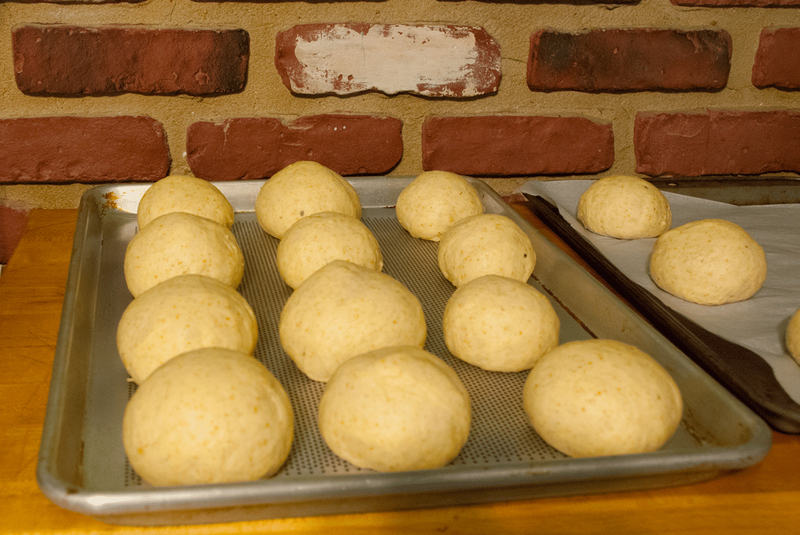 Bake the rolls at 450 degrees for the first 5 minutes and lower the oven to 425 degrees until they are nice and brown. Just make sure that they don't turn into charcoal like mine almost did :). 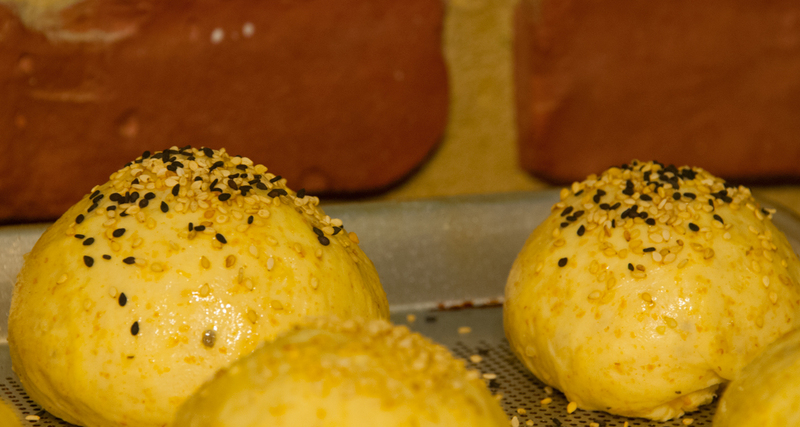 Boldly Baked Buns, Cleo knows these will taste way better than the wimpy colored ones! Nice balking Ian and have a great weekend! 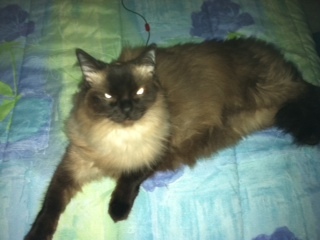 Cleo does have good taste for a Ragdoll! These are tasty rolls....I will have to make these again for sure. It's not as hot as by you where I think Inferno would best describe it but it's humid like Florida right now. Hope you have a great weekend yourself. I hope you enjoy if you try it some day. Appreciate your kind words. I hope your son enjoy these. Lovely Baps, I do love a bold bake. Cheers right back at you! Cooking up some T-bones and roasted potatoes and black beans...could go for a nice Cold one with it! Agreed, these are great for grilling or just with some simple cheese or butter for breakfast. Look forward to your next post. I need you to remind me which bread you baked that used the chocolate malt...I picked some up the other day and want to use it now. Thanks for the reminder. I'm pretty sure I printed this out, but my binder is so thick and disorganized I will just print it again. As soon as I can get through the 4th of July week hopefully this month I will have time to try this. 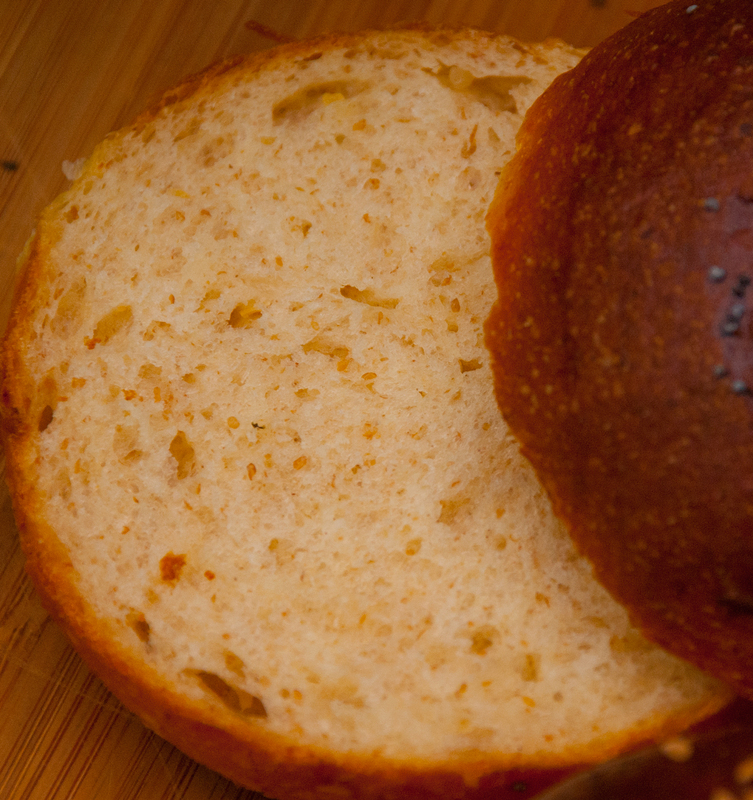 for some great tasting burger buns. Lovely color on the crust and tasty add in's...what is parmesan powder and how does the flavor come through? Appreciate your kind words and I'm glad you enjoyed my post. Parmesan powder....my wife bought a few bottles a while ago from some home party. It's basically parmesan cheese in a concentrated powder form. They may add a few other spices as well but I don't recall. You can order cheese powder from www.penzeys.com . You can certainly add some fresh grated cheese in place of the powder but I would increase it a bit so the flavor comes through. Ian, those rolls sound delicious and they look great too. So great they remind me of these beauties Sylvia made. Now I have a second bar to try to reach! Thank you so much. I will have to try Sylvia's as well. These did come out very tasty and now I'm making a bunch of hot dog rolls with a similar formula but tweaked just a bit. I made your rolls with some SD and yeast (levain was raring to go, mixed in a bit of extra mashed potato too). Happy campers, here; enjoyed these for lunch last weekend. Sorry for the late reply as I was on vacation in Costa Rica and only just saw this now. Looks like your adaptation turned out great. Glad you enjoyed them. Hi Ian. Those look picture perfect. Good enough for a high end steak house burger. Nice! I just realized that I have yet to try baking buns/rolls. I find myself wanting to, but then when it comes time to bake, I opt for a loaf. You do need to give some rolls a try. You won't be disappointed. Appreciate your kind words and I'm glad you like my rolls. Thanks so much for the link to make your own cheese powder and cheese puffs. I will definetly give it a try at some point. This week I'm busy getting ready for 4th of July party as I volunteered to make food including hot dog buns and pretzel rolls. Hopefully I will have a little time to try something new as well. oh yeah.. more buns!! i love pretzel dying to learn .. look forward for your post!! They are easy to make. If you are afraid of the food grade lye you can use baking soda but you may not get as dark of a crust on them. What attractive looking buns, Ian! so substancial to hold all the goodies, and yet soft enough for a bun. You make gorgeous buns, Ian. Always great to hear your kind words Khalid. While these may not be the healthiest rolls they sure are tasty. I will have to try a yeast water version and see how that compares. These are gorgeous, Ian. Would you mind if I featured them up front for a bit? That would be an honor! I definitely will try this recipe. In your ingredients, you list European style flour. Is this the 00 stuff? Please clarify if you have a moment. No, European style flour is a King Arthur Flour invention. It has some white whole wheat mixed in with wheat flour, and malted barley. Let me know how it comes out. You can certainly sub some AP flour and add in some white whole wheat if you have it. 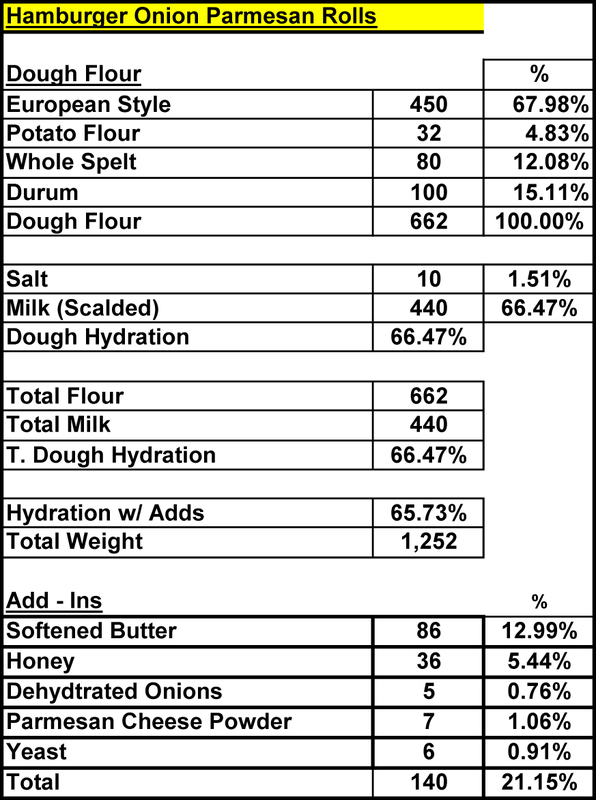 The protein content is about 11.7% which is much higher than 00 style flour. Why do you boil the milk? Sorry for the late reply. Was on vacation and didn't see your question. Thai be honest I'm not sure. I adapted the procedure for this from several other recipes but I will find out and let you know. I think it has to do with effecting the enzymes in the milk. There's an enzyme called protease which inhibits the rise of bread. Pasteurization does not reach sufficient temperatures to kill it. So go ahead and continue to scald the milk; your bread will rise better for it. 0. 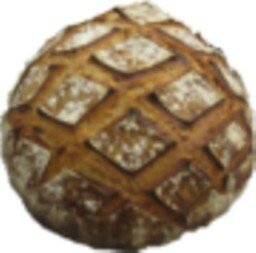 What's the % of white whole wheat in the Euro flour? 1. How much does each of your buns weigh? i.e. How many buns does this formula yield? 2. How big are your buns :-) :-) :-) (approximate diameter)? Would it be big enough for a 4' burger? 3. This formula is 100% commercial yeast leavened. If I'm using starter and yeast water, how many grams per bun would you recommend in order to yield a bun of the same size in #2 above or one that's big enough to hold a 4' burger? 4. Do I need to re-hydrate the dried onions (either with liquid in or outside the formula)? So sorry for the late reply. I didn't see this until now. if you make the rolls 125-130 grams they will be big enough. That goes for YW version as well. yes, rehydrate the onions in the water you are using for the main dough. I don't have the diameter but I know this weight works well. You can flatten the roll after shaping as well. Let me know how it came out. I'll make burgers tomorrow and post a picture of the inside if I remember! I'm sure they will go great with your burgers. I've used fresh cheese many times and it's a great substitution if not even better. Glad you let me know how it came out.